Most of us have experienced out of the blue an opportunity to pitch to a key person. Unprepared unrehearsed this could easily be one of those big regrets. GBP Business club wants to make sure that none of our members will ever be taken off guard at a party, in a lift or just as you turn the corner. Your 90 second elevator pitch will make sure your target person remembers you for the right reason. Members elevator pitches will critiqued and role played by all attending members on the day. All you have to do, is make sure you are a fully subscribed member to attend and participate as we will have a lot of fun with our judging panel and mystery buyers in our mist. There will also be lots of opportunities to grow your business network with business people of networth (37 Business Thoughts) grab a copy here. 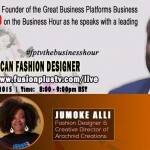 A Close up with Jumoke Alli, Fashion Designer Watch Reena Malra,and see how money is made in real estate!